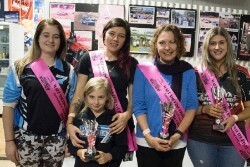 For the second time in history, the Trade Hire Augusta Margaret River Speedway will host its Queen of the River event on Saturday the 30th of March and with twenty-seven nominations already received, it is sure to be a massive show. Productions and Street Stocks will race together in this all ladies event and with the success of last years event, won by regular Production Sedan driver Jess Hall over Street Stock racer Donna Vanzetti and Tara Thompson, the event has grown for the 2019 version. All three of the aforementioned drivers have already nominated for the event, Hall aboard her own #29 Sigma while Vanzetti will be driving the potent Wayne Thomson owned #15 Street Stock and Thompson is in the Joe Wilson #36. In fact, many of the drivers are the wives, partners or other relatives of regular drivers who have entrusted their beloved with their cars, including Alex Williams fiance Jess Crawford, Josh Martinellis partner Shannon Penfold and Kyle Sayers partner Rhiannon Hart just to name a few. Others including Stefani Ameduri, the daughter of Street Stock racer Daniel, Nikki Gardner, partner of Shaun Brewer, and Jody Terkildsen, wife of Jamie are also competing and ready to go out and show their male counterparts what they are capable of. Regular Production Sedan drivers Coby Stevens, Leticia Hamon, Shirley Katona and Bev Brewer have also nominated as have Street Stock competitors including Linda Yates and Tracey Saunders. Add in Karen Does, the daughter of the legendary Brian Rose, wife of Production Sedan driver Frank Does and mother of former Junior competitors Tegan, Hannah and Ebony, the returning Jazzie Lawrence who races for the first time since Junior Sedans, and the hard charging Tash Brennan and this is going to be a huge event that you will not want to miss! Of course, this event is more for the women to get in and have some fun, with even a female Chief Steward controlling the races in Deb Hall, but despite the fun for everyone attitude, these women will certainly be giving it their all come race time! Make sure you are at the Trade Hire Augusta Margaret River Speedway on Saturday the 30th of March.